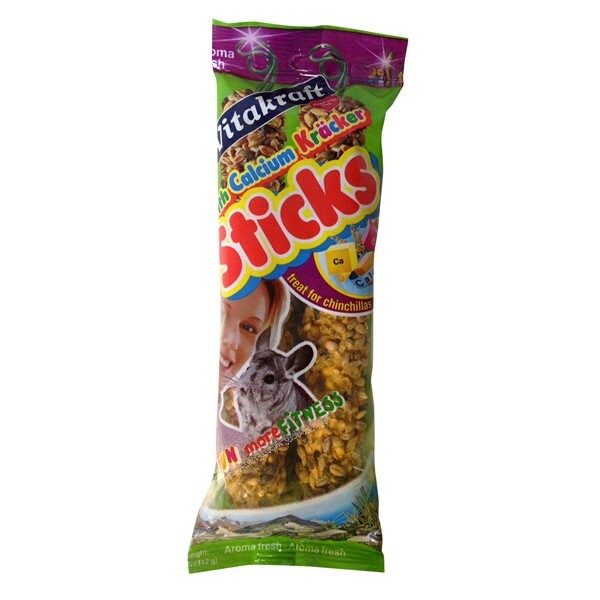 Vitakraft Chinchilla Crunch Calcium Sticks are tasty treats which have been triple baked for improved taste and crunch. Underneath is a natural wood stick which provide long-lasting chewing fun. The treats are fortified with extra calcium to support teeth and bone development. Wheat, Wheat flour, Rapeseed, Rice, Barley, Buckwheat, Corn starch, Calcium carbonate, Calcium propionate (a preservative), Lecithin, Vegetable oil, Color added (yellow 5, yellow 6), Vitamin A supplement, Vitamin D3 supplement, Vitamin E supplement, Riboflavin supplement, Pyridoxine hydrochloride, Vitamin B12 supplement, Niacin supplement, d-Calcium pantothenate, Biotin, Choline chloride. There are currently no questions for Vitakraft Chinchilla Crunch Calcium Sticks - be the first to ask one!